Appreciate having Ken bring his buddies from Ohio to fish with us again. Great having a good crew aboard. 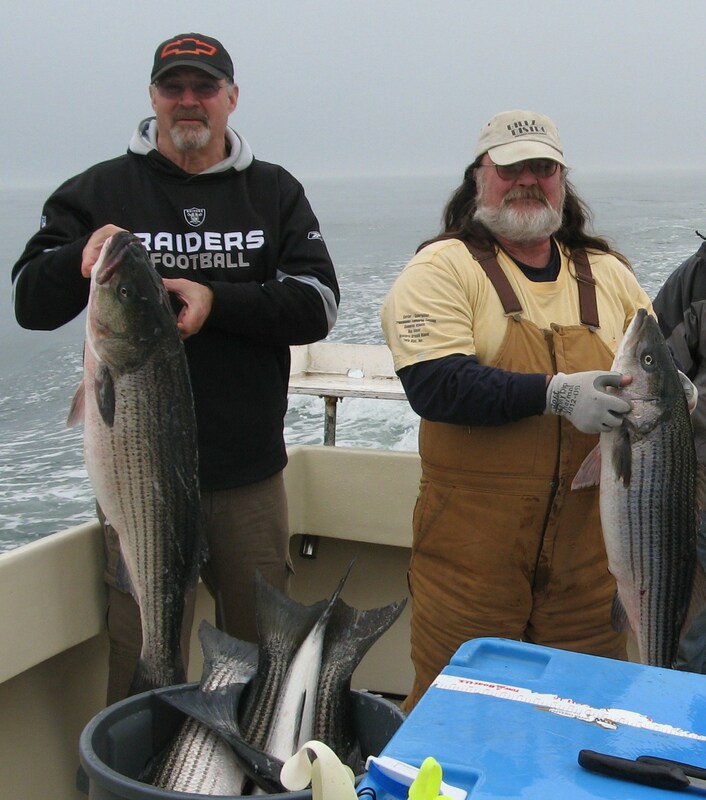 Stan shows off one of our stripers that made out limit. Thanks to all for making the long trip and look forward to having you back aboard soon! Brothers Adam and Greg did their part to bring home our limit of monster stripers. Great having you fish with us and look forward to the next time! Appreciate having Ray and his gang fish with us. Thankfully we had beautiful weather and solid fishing. They took home plenty of fat fillets and will hopefully be back aboard with us real soon. Thanks Ray. Appreciate your business. We appreciate having Kurt and his group aboard with us today. It was a great day all around – the folks were great, the fish were close, and we pulled the stripers over the back of the boat like grapes! Included in the bunch was this 40 pound citation striper caught by our youngest angler, Wyatt! A great day indeed. We are proud of you Wyatt and hope you will give us the chance to fish with you again! After a long, rainy, foggy ride we had to look hard to find the fish but patience paid off. All rods went down and we easily caught our limit, heading back to the dock with all we needed. Thanks Pete for coming and bring your gang to fish with us. We appreciate it. Cliff and his crew made haste of getting their limit of nice size rock. And the fact that the fish had moved closer was a big plus. Appreciate your business fellows! It was all rods down and fish all around for Bert and his gang! Everybody took their turns reeling ’em in as the fishing was wide open and all you wanted! As always, appreciate your business and look forward to the next time Bert! Congratulations to one of the Mackie brothers on this state citation striper – 46 lbs. 8 oz.! “Hey guys…we’re trollin’, not chumming!” In spite of the mean seas on the Atlantic Saturday, Tim Mackie’s crew hung in there and managed to bring in their limit of monster rock! And hopefully, while eating some of their catch deliciously prepared at Waterman’s that night, some of the memories of the rough waters started to fade. Thanks guys – we appreciate your business!